Hisham S. Wahba Mikhael, MD, PhD, Prof.
Abdominal imaging • Residency Program Director at the National Cancer Institute with 15 years of experience. Focused on thoracic (pulmonary) and abdominal imaging. "Report was very detailed and luckily very reassuring rather than bad news. I am delighted with both the service and your analysis and will recommend diagnose.me to anyone who needs a second opinion." I'm a Consultant Radiologist and Residency Program Director at the National Cancer Institute. I have over 13 years of experience in diagnostic radiology. My fields of interest are thoracic and abdominal imaging. I am educated in Egypt, Canada, and USA. Thank you very much for your excellent report - it has clarified a lot of things for me. 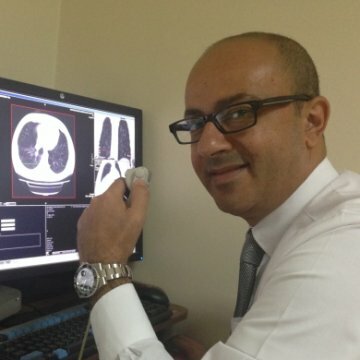 Dr. Hisham S. Wahba, by his expertise, provided the answers to a medical situation that lasted more than eight months. And I thank him for it. I am also very satisfied with the report he has given me. It is very well explained, which makes it accessible even if you do not necessarily have the habit of medical vocabulary. And the answer is very fast. Even for someone like me, who does not speak English very well, communication has been easy. I really do not regret having contacted Dr Hisham S. Wahba. Report was very detailed and luckily very reassuring rather than bad news. I am delighted with both the service and your analysis and will recommend diagnose.me to anyone who needs a second opinion. Reversed Halo Sign in Pulmonary Fungal Infection. Clinical Infectious Diseases 46: 1733-7, 2008. Effect of Y-90 SIR-Spheres Therapy for Multiple Liver Metastases in a Variety of Tumors. J Thorac Oncol 5 (12): 1958-62, 2010. The Use of MR Imaging in Treatment Planning for Patients with Rectal Carcinoma: Have You Checked the “DISTANCE”? : Neoadjuvant Chemotherapy Evaluation by MRI Volumetry in Rectal Cancer Followed by Chemoradiation and Total Mesorectal Excision: Initial Experience. J. Magn. Reson. Imaging 38 (3): 726-732, 2013. The Egyptian Journal of Radiology & Nuc. Med., 34 (2): 833 – 847, 2003.